My name is Saigon. I’ve grown up from war, and over the past decade, my economic growth has been quite compelling, compared with other cities in Vietnam, as well as neighboring countries – which is accompanied by increasing income inequalities, friction between consumption choices, difference in cultural identities, and loosened social ties. We hope you’ll continue this letter by participating in TEDxSaigon. Let our speakers take you on an emotional and intellectual journey. Over the course of one afternoon, we invite you to think, take the opportunity to deliberate and collaborate with other prepared minds, and take actions on your dreams. If all of that is not persuasive enough, think of Gödel’s Incompleteness Theorems: no closed logical system can stand alone. Core to Saigon’s culture is embracing your unique ideas and perspectives. 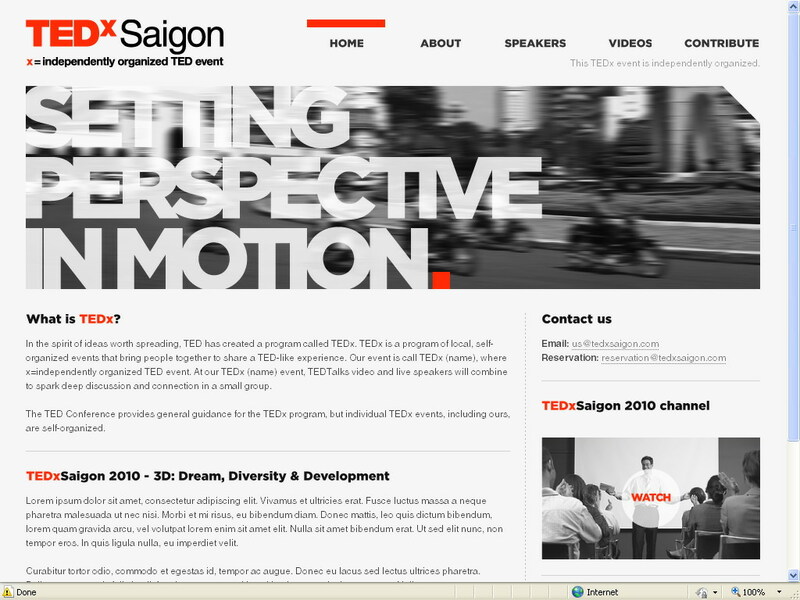 Welcome to the first ever TEDx event in Vietnam: TEDxSaigon 2010 — “Dream, Diversity and Development”. This invitation-only, independently organized TEDx event, which will take place on 15 August at RMIT University Saigon South, is an inspiring example of what I wrote about in another post entitled Empower Vietnamese Youth, about VietAbroader (VA), a non-profit, student-run organization. These types of initiatives, in both cases organized by students, are the building blocks of a vibrant civil society (source: London School of Economics Centre for Civil Society) that will benefit Vietnam in countless ways, tangible and intangible. TED is a small nonprofit devoted to Ideas Worth Spreading. It started out (in 1984) as a conference bringing together people from three worlds: Technology, Entertainment, Design. Since then its scope has become ever broader. Along with two annual conferences — the TED Conference in Long Beach and Palm Springs each spring, and the TEDGlobal conference in Oxford UK each summer — TED includes the award-winning TEDTalks video site, the Open Translation Project and Open TV Project, the inspiring TEDx program and the annual TED Prize.